© 2013-2019, Kevan Hashemi, Open Source Instruments Inc. The Subcutaneous Transmitter (A3028) is an implantable telemetry sensor for rats and mice that provides high-fidelity amplification and recording of one or two biopotential inputs. The device comes in rechargeable and non-rechargeable versions, as well as fully-implantable and head-mounting versions. Warning: Check to make sure devices are inactive upon arrival at your facility. Do not store within 10 cm of iron tools, power transformers, computers, or external hard drives. During implantation, take note that stainless steel tools and work surfaces are often magnetic, and can either activate and deactivate your transmitters. Figure: Subcutaneous Transmitter A3028A-CCC. Body 13 mm wide, 13 mm long, 8 mm deep, volume 1.3 ml. The three leads are 45 mm long and 0.7 mm in diameter. The red lead is the X input, yellow is the Y input, and the blue is the reference voltage, C (see schematic). Electrodes are pins for X and Y (called D-electrodes) and a screw for C (called C-electrode). The A3028A displaces volume 1.3 ml and provides two EEG channels with bandwidth 160-Hz for fifteen days. The A3028E displaces 2.8 ml, and provides one EEG channel with 160 Hz and 512 SPS for eighteen weeks. Both the A3028A and A3028E are fully-implantable beneth the skin of an animal. The A3028M is a head fixture with replaceable battery that provides two EEG channels with 640-Hz and 2048 SPS for four days. The A3028M may be mounted on the skull of an animal, but may not be implanted beneath the skin. 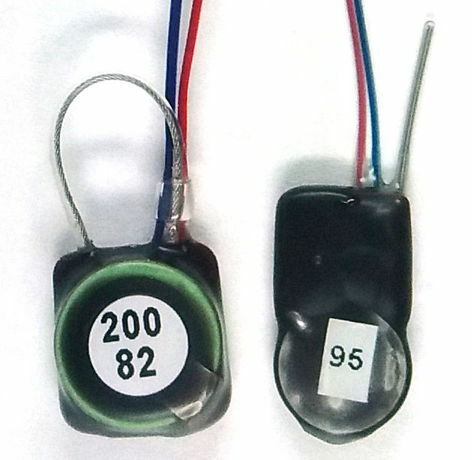 Figure: Subcutaneous Transmitter A3028B (Left) and A3038P (Right) Seen From Top and Side. 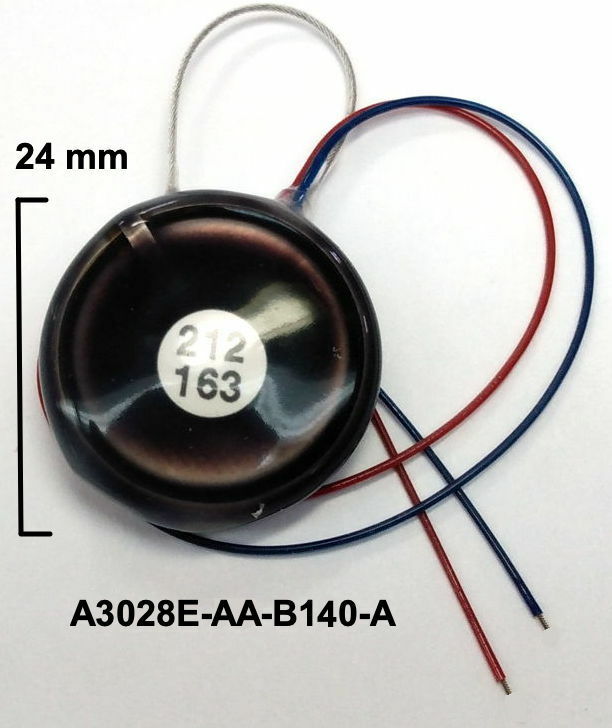 The A3028B has volume 1.3 ml and is equipped with 0.7-mm diameter leads and a 30-mm loop antenna. The A3028P has volume 0.6 ml and is equipped with 0.5-mm leads and a 13-mm helical antenna. All versions of the A3028 operate within our Subcutaneous Transmitter System. Non-rechargeable batteries offer three times the charge density of rechargeable batteries. As a consequence, non-rechargeable transmitters offer two to three times the operating life of rechargeable transmitters. Rechargeable transmitters may be restored to full capacity after each implantation, but their electrode leads suffer the same damage and length reduction as those of a non-rechargeable transmitter. We warranty all our implantable devices against corrosion and manufacturing defect for one year after delivery. But we do not warranty the devices against damage during explantation, which is traumatic to the leads and antenna. You can follow our recharging and soldering instructions to recharge batteries and replace damaged leads. But you may prefer to send your rechargeable transmitters back to use after each implantation. For a fee, we will recharge their batteries, test them, and repair damaged leads as needed. Our price list gives the cost of these services and of the transmitters themselves. Transmitters with battery holders are intended to be mounted in head fixtures, and we deliver them with a plastic enclosure that may be cemented to an animal's skull. Their batteries may be replaced at any time. Figure: Subcutaneous Transmitter A3028D-DDA. The transmitter body is 24 mm in diameter and 7 mm deep, depending upon where we measure it. The body displaces 2.8 ml. The three leads are 150 mm long and 0.7 mm in diameter. Two are equipped with pins (called D-electrodes), the third is a bare helical wire (called A-electrode). We turn the transmitter on and off with a magnet. We recommend a cow magnet. The A3028A comes with three helical stainless-steel leads coated with silicone. The three leads provide us with two biopotential inputs, X and Y, that share a common ground, C. The sensor measures the voltage difference X − C and Y − C. The electrodes at the end of the wires can be stainless steel screws, gold pins, or bare helical wire, as we discuss in Electrodes and The Source of EEG. Table: Specifications of the A3028A. The mains hum is for an implanted sensor. The shelf life and operating life are the time it takes the off-state and on-state currents to run down a fresh battery. 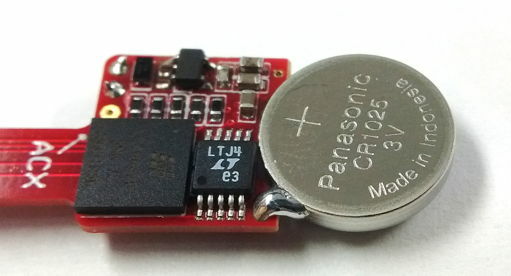 The A3028D is the same circuit with the same functionality as the A3028A, but with a 255 mA-hr battery instead of the A3028A's 48 mA-hr battery. The A3028D's volume is 3.0 ml and its operating life is 1900 hours. All versions of the A3028 turn on and off with the application of a magnetic field. We like to use cow magnets. Component U2 is a micro-power hall effect switch. When it detects a magnetic field, it asserts its output. When we remove the field, the transmitter changes state. If it is inactive, it activates. If it is active, it deactivates. The state change does not occur when we bring the magnet close to the transmitter, it occurs when we move the magnet away. Figure: Subcutaneous Transmitter A3028E-R-AA. Recharged to full capacity through EEG leads between implants. The body is 32 mm long, 21 mm wide and at 9 mm deep at its thickest point. Displacement volume is 4.0 ml. The leads are 150-mm long and tipped with bare steel wire electrodes that can be stretched out, cut, and held in place with a skull screw. We determine the version of a transmitter during assembly, programming, and encapsulation. We might change capacitors on the board to set the filter frequencies. We might change resistors to set the gain. We program the logic chip to set the sample rate for each channel. We can equip the circuit with various sizes of battery. The larger the battery, the longer the operating life. 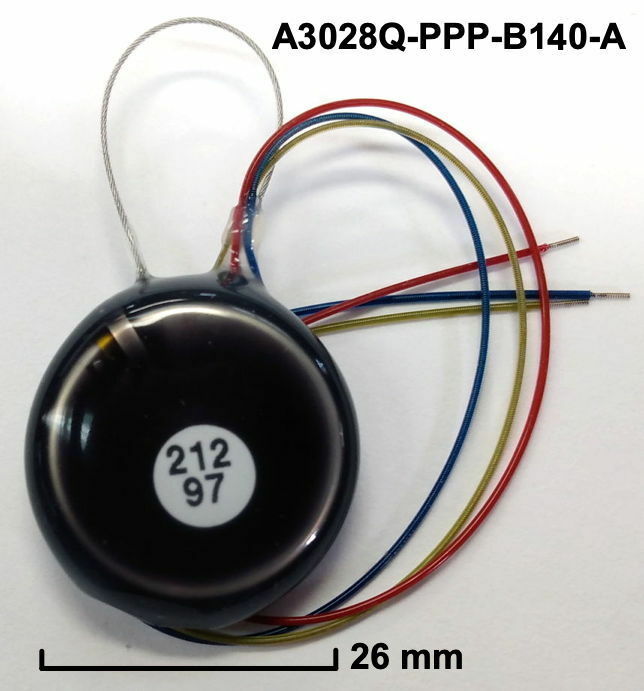 Figure: Subcutaneous Transmitter A3028M-AAA. Bandwidth 0.3-640 Hz, 2048 SPS each channel, replaceable battery, 100 hrs operating life per battery. The bottom side of the non-implantable head fixture devices is bare, sanded epoxy. The device may be bonded directly to the skull or placed in a head fixture designed and tested by one of our customers. The A3028 transmits either one or two signals. Each signal has its own channel number. Each sample of each signal is transmitter by the A3028 with a radio-frequency message. Each message contains a channel number, as we describe in Message Encoding. Channel numbers lie in the range 1-222. A two-channel transmitter transmits on channels n and n+1, where n is an odd number. Figure: A Bare Pup Transmitter Circuit. 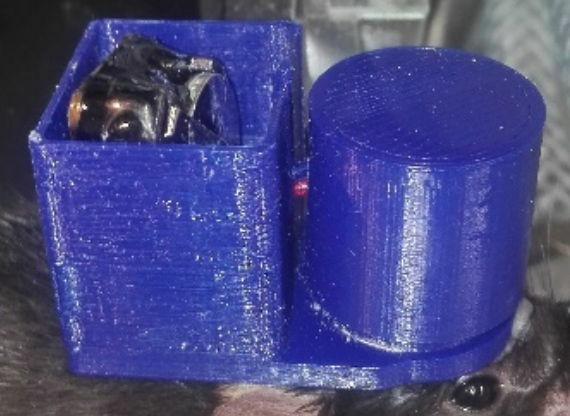 We have not yet attached the leads and antenna, but the 10-mm diameter battery is loaded. We can program the A3028 to take anything from 128-4096 SPS. We can enable either or both of its inputs. The A3028PV1 circuit is a variant of the A3028 circuit that provides only input. The circuit board itself is only 10.2 mm wide and 9.6 mm high, compared to 12 mm square for the two-input circuit. The following table presents the most popular versions of the A3028 along with others that illustrate what is possible by re-programming the circuit and equipping it with a new battery. Any device with "-R" at the end of its name is rechargeable through its EEG leads. Table: Fully-Implantable Versions of the A3028. Parts "-R" are recharegeable through their EEG leads. We give dynamic range, frequency range, and sample rate for both channels. The typical operating and shelf lives are the typical time it takes a transmitter to run down its battery in the active and inactive states respectively. The guaranteed operating life is 90% of the typical operating life. Input impedance 10 MΩ for all versions. The shelf life for a non-rechargeable transmitter is how long it takes to exhaust the battery permanently when we leave it inactive on the shelf. The shelf life of a rechargeable transmitter is how often we must re-charge it to keep its battery in good condition. See below for details of current consumption and how to calculate battery life of new versions of the A3028. The following versions are for head fixtures only. These devices come with their own plastic enclosure for mounting to the animal skull. Their batteries are in holders from which they may be removed and replaced. Table: Head Fixture Versions of the A3028. Batteries are coin cells that may be removed and replaced. The transmitter comes with a head fixture enclosure that is cemented to the animal skull. All versions provide stimulus protection on both inputs by means of three resistors and two capacitors. The resistors protect against applied voltages up to ±50 V. The capacitors attenuate radio-frequency noise that might otherwise be picked up from the antenna and demodulated in the amplifier inputs. Prior to batch 111, only the A3028R provided stimulus protection. Now that all versions provide this protection, the A3028E and A3028R are identical, and we have retired the A3028R version from our table. 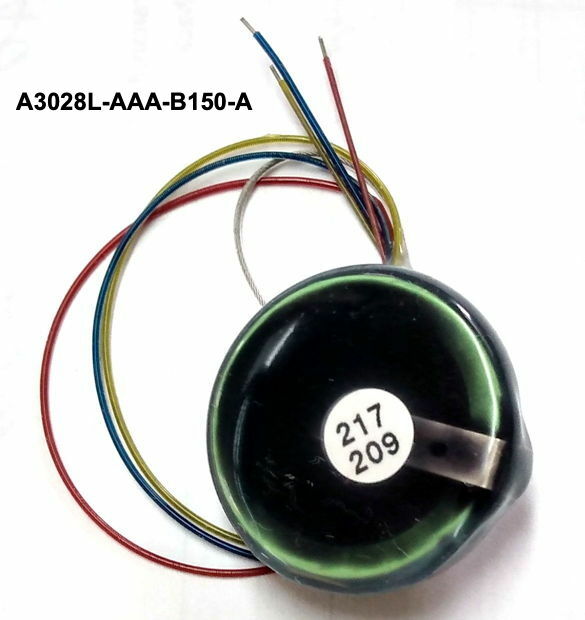 The A3028 electrode leads are color-coded with colors that do not blend with the natural color of animal tissue. The X lead is red, Y is yellow, and C is blue. A dual-channel transmitter produces two radio-frequency message sequences with two separate channel numbers. The lower of the two is X and the higher is Y. A single-channel transmitter may be equipped with only X or only Y. If the single channel is X, the leads will be red and blue. If the single channel is Y, the leads will be yellow and blue. Figure: Subcutaneous Transmitter Circuit A3028T-R Showing ML621 Battery Before Encapsulation. The battery is 6.8 mm in diameter. By default, we set the top of the frequency range at one third the sample rate. When its cut-off frequency is one third the sample rate, the A3028's low-pass filter provides 20 dB of attenuition at one half the sample rate. Frequencies above one half the sample rate will be distorted by sampling, and so compromise the fidelity of the recording. Because the EEG signal contains less and less power as frequency increases, this attenuition is sufficient to ensure that distorted frequencies are insignificant. When recording from EMG at a sample rate of 512 SPS, however, the power above 256 Hz can be greater than the power below 256 Hz. If we want to eliminate sampling distortion (also called "aliasing"), we can place the top of the frequency range at one sixth the sample rate. Now the A3028's low-pass filter provides 40 dB of attenuition at one half the sample rate, and the recorded signal will be uncorrupted. The A3028J is a dual-channel transmitter with 512 SPS on both channels, but the second channel is designed for EMG recording, and has frequency range 0.3-80 Hz, while the first channel is designed for EEG recording, and has frequency range 0.3-160 Hz. Each lead of the transmitter has its own terminating electrode. Each electrode type has a one-letter name, as given in the table below. We specify these electrodes with two letters for a single-channel transmitter (X or Y, and C) and three letters for a dual-channel (X, Y, and C). Click on the letter for a data sheet or photograph. 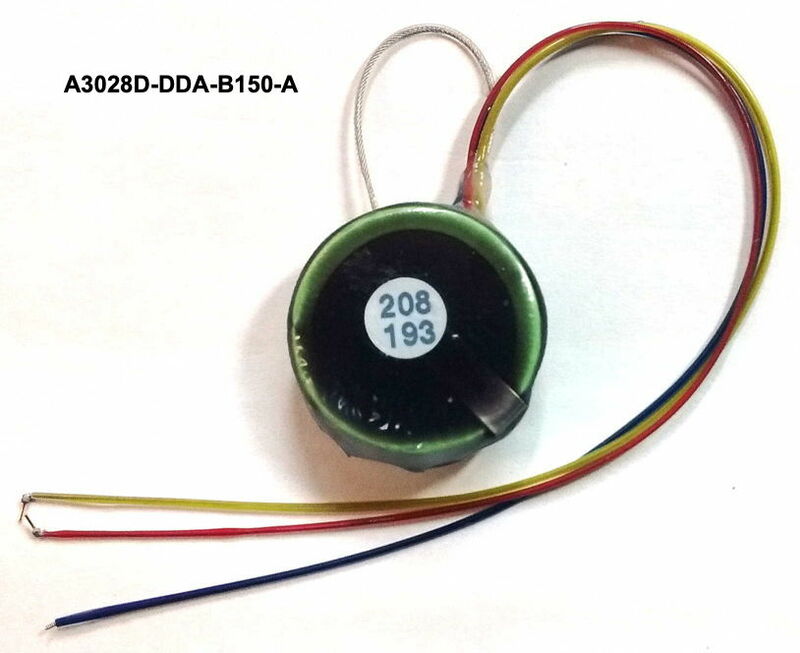 The A3028A-DDC is a two-channel transmitter, sample rate 515 SPS on each channel, volume 1.3 ml, with 1.9-mm long pins on X and Y, and a 0.6-mm long screw on C. The A3028A-HFC has a depth electrode on X, a gold-plated pin on Y, and a screw on C. The A3028A-CMC has a screw for EEG on X, a 25-mm silver bare for EMG on Y, and another screw for EEG ground on C.
See SCT Implantation for an introduction to the implantation procedure. Join the OSI-Neuroscience mailing list to ask our customers about details of implantation. The following files define the A3028 design. Note that we distribute all these files under the GNU Public License. S3028A_1.gif: 2×0.3-160 Hz, A3028AAV1 and A3028AAV2. S3028E_1.gif: 1×0.3-160 Hz, 1×0.3-80 Hz, A3028AV5. S3028F_1.gif: 1×0.3-160 Hz, 1×0.3-80 Hz, no U1, A3028GV1. S3028P_1.gif: 1×0.3-40 Hz, with charging diodes, A3028PV1. A3028PV1.ods: Bill of materials for A3028PV1. A3028GV1.ods: Bill of materials for A3028GV1. A3028AV3.ods: Bill of materials for A3028AV3. A3028AV4.ods: Bill of materials for A3028AV4. A3028AV5.ods: Bill of materials for A3028AV5. A3028RV1.ods: Bill of materials for A3028RV1. A3028RV2.ods: Bill of materials for A3028RV2. A302801E_Panel.zip: Panel 5 × 2 of A302801E. A302801F_Panel.zip: Panel 5 × 2 of A302801F. A302801F_Panel.pdf: Outline of A302801F panel 5 × 2. A3028PV1_Top.gif: Component map of A3028PV1, top side. A3028PV1_Bottom.gif: Component map of A3028PV1, bottom. A3028GV1_Top.gif: Component map of A3028GV1, top side. A3028GV1_Bottom.gif: Component map of A3028GV1, bottom. A3028AV5_Top.gif: Component map of A3028AV5, top side. A3028AV5_Bottom.gif: Component map of A3028AV5, bottom side. A3028RV1_Top.gif: Component map of A3028RV1, top side. A3028RV1_Bottom.gif: Component map of A3028RV1, bottom side. A3028RV2_Top.png: Component map of A3028RV2, top side. A3028RV2_Bottom.png: Component map of A3028RV2, bottom side. A3028RV3_Top.png: Component map of A3028RV3, top side. A3028RV3_Bottom.png: Component map of A3028RV3, bottom side. Code: Logic chip firmware library. BR1225: Diameter 12 mm battery electrical data sheet. BR1225AHB: Diameter 12 mm battery mechanical drawing. BR2330: Diameter 23 mm battery electrical data sheet. BR2330AHD: Diameter 23 mm battery mechanical drawing. The A3028 provides two amplifiers for recording two channels of EEG, or simultaneous EEG/EMG recording. The photographs below show an early version of the circuit, which is similar to all subsequent versions. Figure: Detail of the A3028 Circuit, Version AV1. Once the neck is cut off, the circuit is 12.7 mm square. Left: top side with, clockwise from top-left, the logic chip, 32.768 kHz oscillator, X amplifier, and ADC. Right: bottom side with, clockwise from top-left, power switches, Y amplifier, RF oscillator, magnetic switch, and 1.8-V regulator. For the entire circuit with programming extension see here. 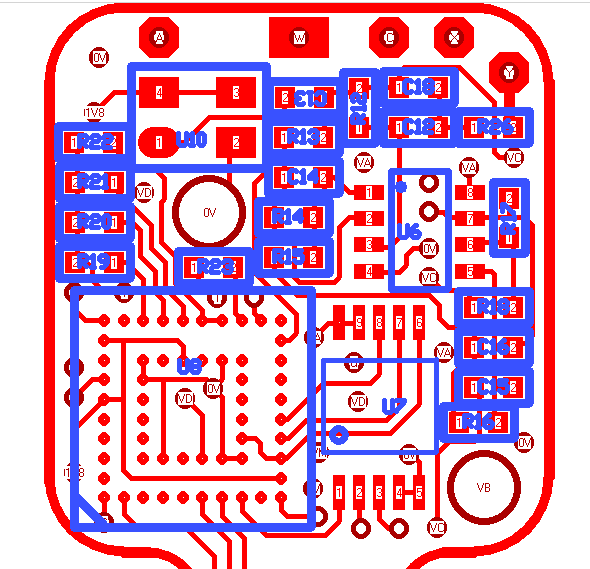 The A3028GV1's circuit board has a red solder mask. The A03028GV1 provides input protection, but it eliminates an unecessary mosfet switch, U1, that was responsible for the "resistive switch" failure in our accelerated aging tests. In place of the mosfet switch we add a few more decoupling capacitors, which reduce the amplitude of the switching noise generated by the magnetic sensor. We purchase boards fully-loaded with parts from our assembly house. We change various capacitors and resistors to create new versions of the assembly. The table below shows how we can modify the A3028GV1 assembly to create all versions of the A3028 other than the P and T versions. We modify only those components that are necessary for the new version to function correctly. Table: Modifications to the A3028GV1 Assembly. Entries marked "same" mean no modification is required. 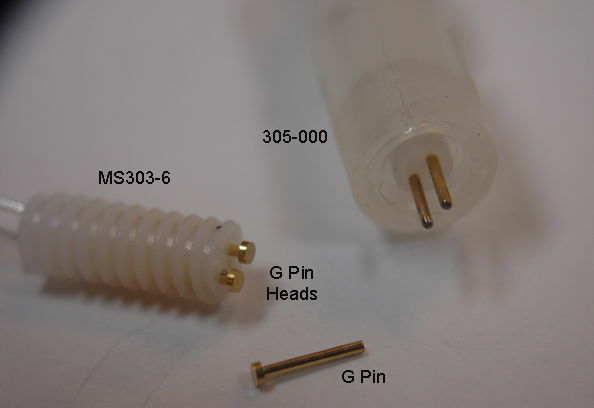 For the locations of components see A3028GV1_Top and A3028GV1_Bottom. The following table gives modifications to the A3028PV1 assembly to create the A3028P and A3028T series of devices. Table: Modifications to the A3028PV1 Assembly. Entries marked "same" mean no modification is required. For the locations of components see A3028PV1_Top and A3028PV1_Bottom. Two-channel versions of the A3028 have three input leads named X, Y, and C. They are red, yellow, and blue respectively. You can see all three declared with in the circuit diagram. 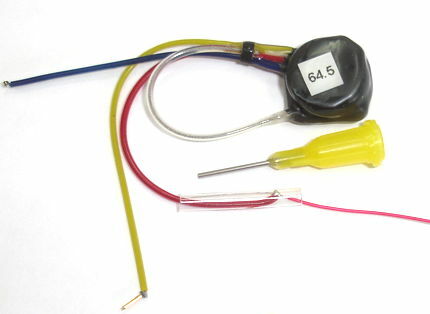 We make single-channel versions of the same transmitter by omitting either the red or the yellow lead. The A3028P devices provide only one input channel. Its inputs are X and C, as shown in the circuit diagram. X X positive input Connected to VC by 100 nF in series with 10 MΩ. Y Y positive input Connected to VC by 100 nF in series with 10 MΩ. Table: Connections to the A3028 for Non-Rechargeable Devices with 0.3 Hz High-Pass Filter. When we eliminate the high-pass filter, the 100 nF capacitor is replaced by 0 Ω. The rechargeable devices provide access to their batteries through the X and C leads. Diodes permit current to enter X and leave through C. The input impedance of the X input remains 10 MΩ. X X positive input Connected to VC by 100 nF in series with 10 MΩ, connected to VBAT by diode. C shared negative input Connected directly to VC, connected to 0V by diode. Table: Connections to the A3028 for Rechargeable Devices with 0.3 Hz High-Pass Filter. When we eliminate the high-pass filter, the 100 nF capacitor is replaced by 0 Ω. Figure: Epileptiform EEG in Adult Mouse. Recorded with an A3028P providing 0.3-40 Hz and 128 SPS. Seizure provoked by picrotoxin. The ADC produces sixteen-bit values between 0 and 65535. A value of 0 for X means XA = 0V, and 65535 means XA = VBAT. With a fresh battery, VBAT = 2.7 V. In the A3028A, with its gain of 100, each ADC count represents roughly 400 nV at the X and Y inputs. In the last few days of a transmitter's life, the VBAT drops to 2.2 V, at which point the transmitter fails. During this time, the voltage represented by each ADC count drops in proportion to the battery voltage. When VBAT is 2.2 V, one count represents roughly 350 nV. In theory, the dynamic range of the A3028A is 2.7 V ÷ 100 = 27 mV. But in practice, the amplifier is not able to drive XA all the way up to VBAT or all the way down to 0 V. We quote the dynamic range of the A3028A as ±10 mV. But when we convert ADC counts to input voltage, we multiply by 400 nV. 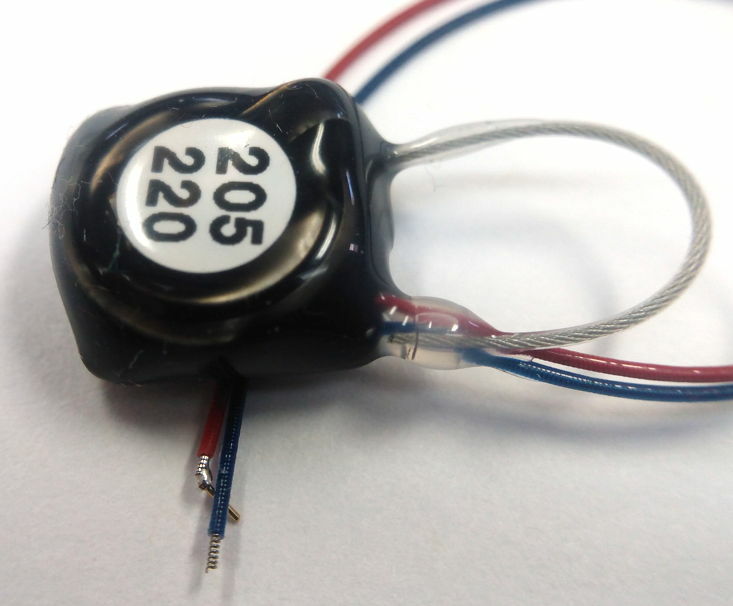 Most versions of the A3028 provide a DC-blocking capacitor at each input. These are C7 and C12 in the schematic. Together with input resistors R5 and R12, they form two single-pole high-pass filters with time constant 1.0 s. There is another high-pass filter in each amplifier, consisting of R6/C8 for X and R13/C13 for Y. These have time constant 0.5 s in most versions of the A3028. The figure below shows the theoretical step response of the A3028A inputs, and compares it to that of other devices we have manufactured. Figure: Input Step Response for Various Circuits. The A3028 plot applies to either X or Y in the A3028A/B/D/E. The common-mode reference voltage in the amplifier is VC, and VC is derived from the battery voltage by a 1.8-V regulator. Thus VC is 1.8 V, and the average value of both XA and YA are also 1.8 V. Thus the average digital value of X and Y correspond to 1.8 V. This allows us to calculate the battery voltage from the average value of either channel. We have VBAT = 65535 / average(X) × 1.8 V. This relation applies to all versions of the A3028, and both inputs, regardless of the gain and frequency response of its amplifiers, and regardless of what battery we have installed. The figure below shows the X signal from an un-encapsulated A3028E as we reduce VBAT from 4.2 V to 1.2 V over 300 s. Our formula for VBAT from the average value of X works down to VBAT = 1.9 V. After that, the X decreases, suggesting an increase in VBAT, when in fact the actual VBAT drops to 1.8 V and the transmitter turns off. Figure: X versus Time. We plot the sixteen bit value of X, with each vertical division being 6553.5 counts. Time is 15 s per division. Power supply voltage is 4.2 V on the left and 1.2 V on the right, so dropping 150 mV per horizontal division. The analog input impedance of X and Y is 10 MΩ in the pass-band of the amplifier. Most versions of the A3028 provide a high-pass filter at 0.3 Hz to remove slowly-varying electrochemical potentials so that the gain of the amplifier can be ×100 and the dynamic range is the battery voltage divided by 100. For non-rechargeable devices, the battery voltage is 2.7 V for most of the operating life of the device, so the dynamic range is 27 mA. We quote ±10 mV in our specification table because the dynamic range is not centered about C. The A3028U amplifier, however operates all the way down to 0.0 Hz and accommodates electrochemical potentials by reducing the amplifier gain to ×10 so that the input dynamic range is ±100 mV. We set the cut-off frequency of the A3028 three-pole, 3-dB ripple, Chebyshev, low-pass filters by our choice of filter capacitance, CF. Most often, we set the cut-off frequency at one third the sample rate. There are three capacitors in each filter that must have the same value for the filter to function properly. They are C9, C10, and C11 for the X filter and C14, C15, and C16 for the Y filter. With CF = 1.0 nF, the cut-off frequency is 160 Hz. The following graph shows how the gain of the two inputs of an A3028A varies with frequency. Figure: Frequency Response of the A3028A. The frequency response in the pass-band shows a slight decrease in gain from 10 Hz to 80 Hz, followed by a bump up at 130 Hz. These two features are the 3-dB ripple of the three-pole Chebyshev filter. By tolerating this non-uniformity of gain in the pass-band, we obtain a far sharper cut-off at the top of the pass-band. Amplitude drops by a factor of ten, or 20 dB from 160 Hz to 256 Hz. Frequencies above 256 Hz when sampled at 512 SPS will produce artificial sin-waves of lower frequency, in a process called aliasing. The purpose of our low-pass filter is to prevent aliasing. 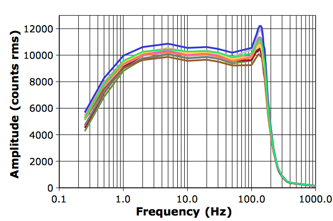 Even with the sharp cut-off of our Chebyshev filter, we might still see aliasing of high frequency components in EEG. Figure: Aliasing of 500-Hz 10-mV Input for 512 SPS and 160-Hz Low-Pass Filter. We see 12 Hz of amplitude 200 μVpp. The plot above shows how 10-mVpp of 500 Hz applied to the X input of an A3028A would appear after low-pass filtering and sampling. The signal has an apparant frequency of 12 Hz, which is 512 − 500. The EEG signal power decreases with frequency, so we can place our cut-off frequency at one third the sample rate and be confident we will see no significant distortion due to aliasing. The same is not true of EMG, in which the signal power density reaches a maximum somewhere between 100-300 Hz. When we record EMG at 512 SPS, we recommend placing the cut-off frequency at one sixth the sample rate, so that all EMG components above half the sample rate will be eliminated by the low-pass filter. The A3028J provides a 0.3-160 Hz EEG input and a 0.3-80 Hz EMG input, both sampled at 512 SPS. Figure: Frequency Response of Eleven A3028Js. We expect some variation between amplifiers, because the three-pole filter is sensitive to the exact component values. The plot below shows the frequency response of a batch of fourteen A3028E transmitters stimulated with a 30-mV sinusoid through a 20 MΩ resistor. At 10 Hz, the fourteen channels agree to within ±0.5 dB. At 130 Hz, where we have the bump in the Chebyshev response, they agree to within ±1 dB. These variations are well within the range we expect with 5% capacitors and 1% resistors. When we apply a pure sinusoidal waveform to the A3028, the sinusoid is amplified, filtered, digitized, transmitted, received, and recorded by the data receiver. The purpose of the A3028 is to provide high-fidelity EEG recordings, so we hope to see only a pure sinusoidal waveform emerge in the frequency spectrum of the recorded signal. We apply a 14-mVpp sinusoid of increasing frequency to the input of an A3028E-R transmitter. We measure the power of the recorded signal after subtracting its fundamental harmonic. This non-fundamental power is a combination of imperfection in the applied sinusoid, noise in the amplifier, and distortion in amplification and transmission of the signal. We divide the non-fundamental power by the total signal power to obtain a measure of the distortion of the sinusoid by the recording process. Figure: Distortion in A3028 Recordings. We plot the ratio of non-fundamental power to total power for a sinusoidal input applied to a device with scattered sampling and another with uniform sampling. Most devices use scattered sampling to extend battery life. For the scattered-sampling devices, distortion remains less than 1% in the 0.3-160 Hz pass-band of the A3028 amplifier. At 10 Hz and below, distortion is less than 0.01%. The distortion power for scattered-sampling devices has a white noise spectrum: it is not distortion of the original sinusoid, but noise added to the sinusoid by the power of the sinusoid. This noise is due to random variation in the sampling instants, which is a feature of the process by which A3028 transmitters avoid systematic collisions with other transmitters. We call it scattering noise. If we sample uniformly, we obtain the second plot shown above, in which distortion is less than 0.003%. With uniform sampling, the non-fundamental power is dominated by periodic signals that may be the result of distortion in the amplifier, or they may be imperfections in the signal produced by our function generator. The figures below show the spectrum of the non-fundamental power with uniform sampling. The A3028U provides a 200-mV dynamic range and 0.0-160 Hz bandwidth on both inputs. Its EEG amplifier gain is only ×10. Figure: Frequency Response of A3028U, X and Y, For 60-mVpp Sinusoid. The least significant bit of the 16-bit digitized samples is 4.1 μV for battery voltage 2.7 V. To avoid We enable uniform sampling for all A3028U devices. Total harmonic distortion remains less than 25 ppm (0.0025%) from 0.03 Hz to 160 Hz. Figure: Distortion in A3028U Recordings, Measured for Both Inputs. Operating band 0.0-160 Hz. The A3028V provides two channels: one running at 496 SPS and 0.3-160 Hz, and one at 16 SPS and 30-640 Hz. The first is for normal EEG recording, the second is for EMG amplitude measurement. The Neuroarchiver will reconstruct the 496 SPS signal into a 512 SPS signal by filling in the missing samples using the previous sample values, and the result will be an EEG signal almost identical to the one we would obtain with 512 SPS. The Neuroarchiver will leave the 16 SPS signal as it is, provided you enter "16 512" for the default frequency in the Neuroarchiver configuration. The figure below shows the gain versus frequency of the EEG and EMG inputs. Our measurement of the EMG gain between 200-500 Hz is erratic because of aliasing noise produced by under-sampling a non-random periodic sinusoid. With a random EMG input, we expect no such error in our measurement of amplitude. Figure: Frequency Response of Three A3028Vs, EEG and EMG Channels. The figure below shows how the A3028R's 160-Hz low-pass filter responds to pulses applied to the X input. Figure: Response of A3028R to 1-ms Pulses of 10 mV Delivered Through 50 Ω. The pulse frequency is 8 Hz. The vertical range is around 12 mV. For 5-ms pulses of 30 mV and 8 Hz delivered through 20 MΩ and the same vertical range, see here. The low-pass filter introduces the ringing after the pulse, which consists of three maxima and minima in damped harmonic oscillation after the pulse has ended. The figure below shows the response of the A3028R to perforant pathway discharge spikes of amplitude roughly 10 mV. The ringing we see after the discharge spikes is not generated by the brain itself, but rather by our low-pass filter. The slow, positive pulse following the negative spike is, however, produced by the brain, and the ringing is overlaid on top of this pulse. [21-AUG-18] The figure below shows the noise spectrum of ten A3028B-AA single-channel transmitters in water at 37°C, as presented in the Amplitude versus Frequency plot of the Neuroarchiver. Figure: Input Noise for Ten A3028B-AA Transmitters in 37°C Water. Horizontal scale is 20 Hz/div. Vertical scale is 400 nV/div. Spectrum obtained from an 8-second interval. 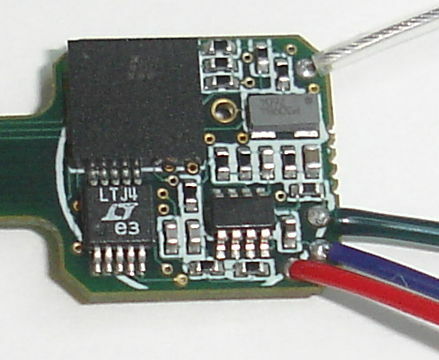 These devices were made with the A3028GV1 circuit board, introduced in January 2018, and the BR1225 battery. The total noise on each input is 5±1 μV rms. The peaks we see at around 20 Hz, along with their harmonics at 40 Hz and 60 Hz, are generated by the magnetic sensor on the circuit board, which turns itself on and off at roughly 20 Hz. We call the signal that generates these peaks switching noise. The switching noise components in the above plot are all less than 1.4 μV. These transmitters are made with the A3028GV1 circuit, which we designed to reduce switching noise, and entered production in January 2018. Since the introduction of the A3028GV1 vircuit, any transmitter with switching noise >4 μV, or total noise >10 μV rms, we reject during quality control. Figure: Input Noise for Three A3028C-CC Transmitters in 37°C Water. Horizontal scale is 10 Hz/div. Vertical scale is 400 nV/div. Spectrum obtained from a 32-second interval. These devices were made with the A3028GV1 circuit board with BR1225 battery. Total noise in 2-80 Hz is ≤6.5 μV. 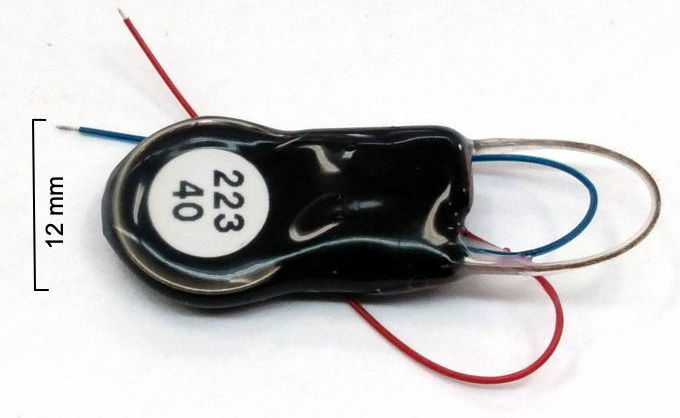 The A3028PV1 circuit used in the A3028P-AA transmitter is equipped with a magnetic sensor that turns itself on and off at only 5 Hz and uses half the current as the sensor on the A3028GV1. Furthermore, the A3028P provides bandwitch only 0.3-40 Hz. The result is total input noise of <4 μV rms and switching noise <0.5 μV. Figure: Input Noise for Twelve A3028P-AA Transmitters in 37°C Water. Horizontal scale is 5 Hz/div. Vertical scale is 200 nV/div. Spectrum obtained from a 32-second interval. Maximum total noise in 0.5-40 Hz is 3.5 μV rms. Transmitters made with A3028PV1 circuit and CR1025 battery. Switching noise is caused by electromagnetic radiation by the bottom side of the battery. The potential of the bottom side is modulated at the magnetic sensor switching frequency by the battery's source resistance. The magnetic sensor is switching itself on and off to reduce its current consumption. Of all the batteries we use with our transmitters, the BR1225 has the highest source resistance and produces the highest switching noise amplitude. Figure: Battery Resistance versus Battery Diameter for Various Battery Types. When the battery is rectangular, we use the geometric mean of its length and width for its diameter. Earlier versions of the A3028B circuit suffered from switching noise up to 12 μV, which was visible in the Fourier transform of 32-second intervals of baseline mouse EEG. We would reject any transmitter with switching noise >6 μV or total noise >16 μV. The A3028GV1 circuit reduced switching noise by increasing the capacitance in parallel with the battery from 10 μF to 40 μF. Figure: Switching Noise of A3028Bs made with A3028RV2 Circuit and BR1225 Battery. The A3028RV2 was in use until JAN-18. We plot the spectrum of an 8-s interval recorded with ten transmitters in a beaker of water at 37°C. The switching noise is the peaks around 20 Hz and their harmonics. Vertical scale is 800 nV/div. and horizontal is 25.6 Hz/div. The largest peak is 6 μV, which is the maximum value we accepted during quality control. [11-MAR-14] The A3028 leads pick up radio-frequency power from the antenna. If the C lead is left open-circuit and the X and Y leads are connected to some solid body, the C lead acts like an antenna. The radio-frequency power it picks up is demodulated by parasitic diodes in the EEG amplifier. The result is noise visible on the EEG, as shown below. Its amplitude is roughly 100 μV rms. If you see such noise in an implanted transmitter, your C lead has a broken conductor. Figure: Broken C-Lead Noise. 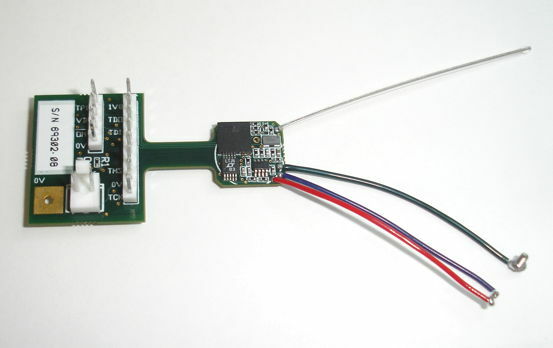 The broken lead is not connected to the animal body, and acts as a radio-frequency antenna. [01-DEC-16] We take a two-channel A3028D made with the A3028RV1 circuit and put it in water at 40°C. We use 8-s recording intervals to measure the amplitude and frequency of the switching noise in each of the two input channels No3 and No4 as the water cooled to 19°C. Figure: Switching Noise Amplitude and Frequency versus Temperature. The transmitter has two channels. No3 is on the bottom side of the circuit board along with the hall effect sensor that generates the noise. No4 is on the top side of the circuit board. The frequency of the switching noise increases with temperature. We perform the same experiment with four transmitters at once, using this processor to calculate the rms amplitude of the fundamental harmonic of the switching noise. Each transmitter is made with the A3028RV1 circuit. Figure: Switching Noise Amplitude versus Temperature. No3/4 is an A3028D, No5 is an A3028B using the X input, No10 is an A3028C using the Y input, No13/14 is an A3028A. In No13/14 the noise is far greater in X than in Y. But in No10 the noise is as large as any we have seen, and appears on the Y input. We touch the tip of a ×1 probe to the package of the Hall Effect Switch on a battery-powered, un-encapsulated transmitter. We see no signe of 20 Hz, certainly less than 200 μV. Suppose we want to know the root mean square amplitude of a biometric signal, or the mean square amplitude, but we do not need to know its exact shape. When we monitor electromyography (EMG), our chief interest may be the power of the signal, to determine if an animal is awake or asleep, rather than examining the fluctuations in the signal itself. As we mention above, when we try to represent a continuous, time-varying signal as a sequence of discrete samples, we must make sure that the variation in the time-varying signal between the sample points approximates a straight line. When we plot the sampled signal, we are going to display it by drawing straight lines between the samples, so these straight lines are supposed to represent what the signal actually did between the samples. If the signal varies greatly between samples, we will not see this variation. Failing to see rapid variations between samples may not concern us, but rapid variations can, through sampling, look like much slower variations when we join the samples with lines. If we sample a 100-Hz signal at 48 SPS, for example, our straight-line reconstruction of the signal will be a 2-Hz sinusoid. This generation of slow variation from rapid variation is aliasing. To avoid aliasing, we must filter the signal we want to sample so that it contains no changes of direction between sample points. With a perfect low-pass filter, which has gain 1.0 up to frequency fc and 0.0 above fc, we can sample at 2fc and avoid aliasing. In practice, low-pass filters are not perfect, and avoiding aliasing is not quite sufficient to provide adequate representation. In the A3028, we sample at 3.2fc. Our low-pass filter gain drops by a factor of 10 from fc to 1.6fc. For example, in our 512 SPS transmitter for EEG, we filter at 160 Hz. The filter gain drops by a factor of ten from 160 Hz to 256 Hz. But aliasing does not change the power of a signal, not unless we somehow miss all the powerful moments of a signal by a spectacularly unfortunate choice of sample instants. For an irregular signal like EMG, sampling at 16 SPS and taking the standard deviation of the samples, will give us a good measure of the EMG signal amplitude. Most EMG power is in the range 40-300 Hz, so we can high-pass filter at 30 Hz and low-pass filter at 320 Hz to separate the EMG from any artifacts that may be generated by our EMG pick-up electrodes, sample at 16 SPS and obtain EMG power at a cost of only 1.8 μA in current consumption. Thus the A3028V monitors EMG on Y and EEG on X and has the same battery life as the single-channel A3028B EEG monitor. [29-MAR-16] We calibrate the A3028 center frequency to lie in the range 913-918 MHz at room temperature, which is around 22°C. The MAX2624 oscillator that provides the radio-frequency signal has a temperature coefficient of −0.2 MHz/°C. In an animal body at 37°C, the center frequency will drop to 910-915 MHz. Our Octal Data Receivers (A3027) and the older Data Receiver (A3018) are designed to provide reliable message reception in for center frequencies in the range 908-918 MHz. The spectrum of the entire signal spans a ±5 MHz range about the center. [02-MAR-18] The antenna connection is marked OUT on the schematic. The antenna transmits the values of X and Y with 7-μs bursts of 902-928 MHz radio waves. The power transmitted during these bursts is roughly 300 μW (−5 dBm). The receiving antenna, which is usually a Loop Antenna (A3015C) connected to an Octal Data Receiver (A3027), must pick up at least 25 pW (−76 dBm) to overcome noise in the receiving antenna amplifiers, and at least four times (12 dB) more than the 902-928 MHz interference power picked up by the receive antenna. In our office, interference power ranges from 100 pW to 100 nW. In order to guarantee reception outside a faraday enclosure, we must receive 1 μW (−30 dBm). Inside an FE2F faraday enclosure, which offers at least ×1000 (30 dB) isolation from interference, we must receive 1 nW (−60 dBm). We make three type of antenna: 50-mm loop, 30-mm loop, and 13-mm helix. We use the 50-mm loop in rat transmitters, the 30-mm loop in mouse transmitters, and the 13-mm helix in pup transmitters. The loop antennas are made of stranded steel wire. The loop antennas are tough and efficient. The helical antenna is made of a steel spring. It is small and flexible, but less efficient. 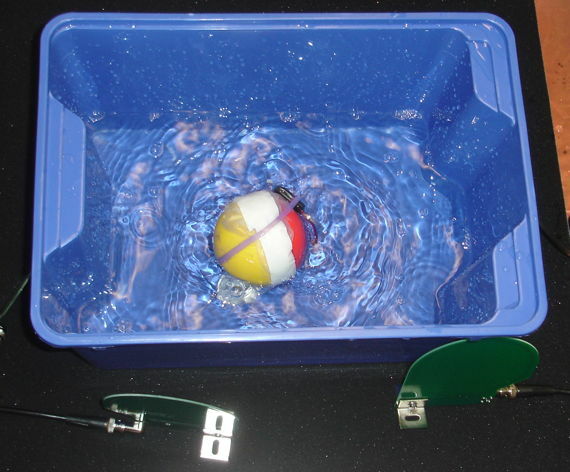 We compared (see here and here) the 50-mm and 30-mm antennas moving in air and water with a self-propelled sphere. We found that the 30-mm antenna performed just as well as the 50-mm in water, and almost as well in air. Given that an animal body is more closely approximated by water than air, we conclude that, when implanted, the 30-mm loop will perform almost as well as the 50-mm loop. When we immerse an A3028E with 50-mm antenna in water, the radio-frequency power it emits remains constant to within a factor of two as we half-immerse it in water, completely immerse it in water, or press it up agains the wall of a water-filled beaker. The center-frequency of its transmission increases by 1 MHz from air to total immersion in water. The dielectric constant of water is ninety times greater than that of air. Water affects the propagation of radio waves along the antenna, slowig them down, so that the effective length of the antenna is greater. The water also affects the oscillator within the transmitter circuit, changing its resonant frequency. When we immerse an A3028A with 30-mm antenna in water, the power it emits rises by a factor of ten (10 dB) and the center-frequency rises by 2 MHz. The figure below is the power spectrum we measure when we hang an A3028A by its leads in air, then surround it with a beaker of water. Figure: Power Received from A3028A with 30-mm Antenna In Air and Water versus Frequency. When half-immersed or pressed up against the wall of a beaker of water, the spectrum lies somewhere between these two extremes. We make our helical antenna out of the same MDC13867A helical spring insulated with silicone that we use for EEG leads. We measured transmitted power versus antenna length in water and in air for these helical antennas by cutting back the antenna in stages. The graph below shows three plots: one for air, one for water with the tip of the antenna insulated from the water, and another in water with the tip of the antenna in contact with the water. 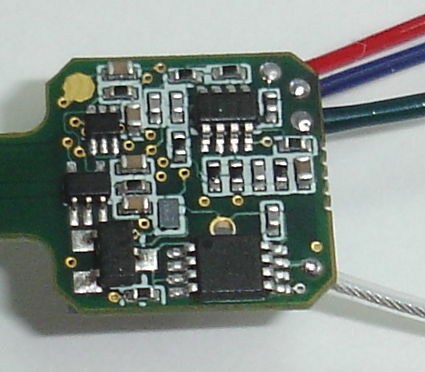 Figure: Power Received from A3028A with Helical Antenna. Each 10 mm of MDC13867A helix contains 60 mm of wire. With the tip un-insulated, we are using the entire 50-ml beaker as an antenna. Even with a 0-mm antenna we get enough power. But if we drop the entire transmitter into the water, we get no power transmitted. We cannot use the entire animal body as a transmit antenna because the body encloses our implanted transmitter. We must insulate the tip of the antenna. We perform similar experiments with the A3028P equipped with a helical antenna, cutting back the antenna and insulating its tip as we go. We obtain the best performance at the edge of a beaker of water with a 5-mm antenna. 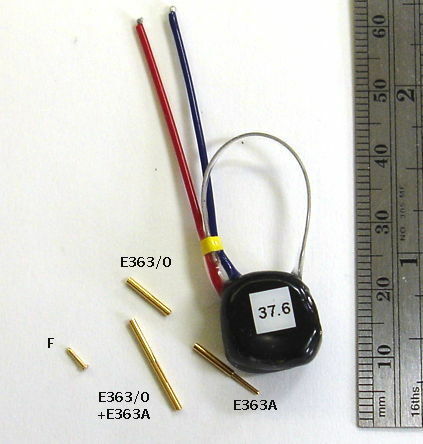 This 5-mm antenna contains 30-mm of wire. But the performance of the 5-mm antenna in air is so poor as to be impractical. We must be able to tell if the transmitter is on or off before we put it on the shelf. We settle upon 13 mm as the best compromise between air, water, and implanted. [05-JAN-19] The following plot shows reception from seven A3028P2 devices with 13-mm helical antennas implanted in mice living in an IVC rack with isolation chamber. Average reception is 97%. Short drops to 80% or below are shared by all seven devices, suggesting that the curtains of the chamber were open for cage cleaning and animal feeding. For a discusion of body capacitance, see Body Capacitance in the A3019 manual. [21-AUG-18] The A3028 can run down its battery sitting on the shelf in its inactive state, sampling and transmitting signals in its active state, or some combination of both. The inactive current of the A3028 consists of the current consumption its magnetic sensor (U2) and its logic switch (U3). The maximum inactive current for temperatures −20°C to +80°C is 2.5 μA. The shelf life of the transmitter is the time it takes the maximum inactive current to drain the battery. The minimum shelf life of any A3028 equipped with a BR1225, 48 mA-hr non-rechargeable battery is 800 days. If we leave such a device inactive on the shelf for 400 days, at least half of its battery capacity will remain. At room temperature, in dry air, the average current consumption of A3028 devices is 1.3 μA for transmitters with volume ≥1.3 ml, and 0.8 μA for smaller transmitters. The shelf life when stored in a laboratory cabinet will be two or three times the minimum shelf life we give in our vesion table. Transmitters equipped with larger batteries have shelf lives of ten years or more, so we can leave them inactive for six months, and lose less than five percent of their operating life. Figure: Example Discharge Curves for Lithium Primary Batteries. We discharge five CR1025, 30-mAhr, 3-V cells with five A3028P3 transmitters, channel numbers given in legend, each consuming ≈75 μA, expected life is 400 hr, observed life is 391-410 hr. We measure VBAT by taking the average of one second's worth of X samples. The average value of X corresponds to VCOM, which is 1.8 V. From this we deduce VBAT, which corresponds to a X = 65535. Rechargeable versions of the A3028 may be recharged to full capacity whenever they are not implanted. We connect the X and C leads to a recharging circuit and wait until the recharge is complete. We describe how we recharge transmitter batteries in our battery recharging instructions. Or we invite you to send your devices back to us for recharging, testing, and lead repair. You will find the cost of such services on our price list. Figure: Discharge of Manganese-Lithium Rechargeable Batteries. Discharges of three A3028T1-R transmitters sitting in a beaker of water, nominal current consumption 32 μA. Battery ML621, nominal capacity 5 mA-hr. Nominal battery life is 160 hr. Suffix "1" is initial discharge, suffixes "2" and "3" are the second and third discharges. The active current of the A3028 is its current consumption in the active state. This current depends upon the number of samples the transmitter takes per second. The A3028B provides one channel with 512 SPS. The active current consists of the quiescent current of the logic chip, which is independent of sample rate, and the consumption of the sample and transmit process, which increases linearly with sample rate. The figure below shows active current versus the total sample rate. To obtain the total sample rate, we add the sample rates of both channels. Figure: Active Current versus Total Sample Rate for Device with Scattered Sampling. Blue line all versions A3028 made with the A3028GV1 circuit board. Orange line the A3028PV1 circuit board, which we use in the A3028P and A3028T devices. The linear trend fitted to the data provides us with the following empirical formula for typical active current, Ia, as a function of the total sample rate, R.
Detail: If we remove the radio-frequency oscillator from an A3028E transmitter, which runs at 512 SPS, the active current consumption drops from around 80 μA to 40 μA. The sample and transmit activity consumes 60 μA, of which 40 μA is transmission and 20 μA is the quiescent current of the logic chip, amplifiers, and regulators. During the 7-μs burst transmissions, the current drawn by the transmission circuits is 11 mA. The active current increases with battery voltage, so the current consumption of the A3028E-R, equipped with a 3.7-V LiPo battery, is 10% greater than that of the A3028E, equipped with a 2.7-V Li primary cell. Figure: Current Consumption versus Battery Voltage for A3028Q. Total sample rate 2048 SPS. The capacity of lithium primary cells decreases with operating current and increases with temperature, as shown in the following plot taken from the BR1225 data sheet. Figure: BR1225 Battery Capacity versus Load Current and Temperature. The above plot suggests that a BR1225 battery delivering 250 μA at 15°C will provide 44 mAhr, or 176 hrs operation. Under these conditions, however, we observe closer to 190 mAhr, which implies the full 48 mAhr capacity. All coin cell battery data sheets strongly discourage soldering directly to the battery. With care, however, we are able to solder directly to lithium primary coin cells without reducing their capacity. Figure: Example Discharge Curves for Soldered Lithium Primary Batteries. We dischage three A3028S5 transmitters equipped with BR1225 batteries soldered to the circuit board. Nominal capacity is 48 mAhr. Current consumption is 250 μA. Temperature is roughly 15°C average day and night. The operating life of the transmitter is the time it takes the active current to exhaust a fresh battery. As the battery is exhausted, the average value of the analog inputs increases, like this. The A3028B single-channel, mouse-sized transmitter has nominal battery capacity 48 mA-hr. According to the above formula, its typical active current is 77 μA. Its typical operating life is 620 hrs. We guarantee an operating life of 90% of its typical operating life, which for the A3028B is 560 hrs. Figure: Current Consumption versus Temperature for A3028P1. Sample rate 128 SPS. The capacity of rechargeable batteries decreases with repeated drain and re-charge cycles. A lithium-polymer (LiPo) battery drained to 5% of capacity and recharged to 95% will endure a hundred charge cycles before its capacity has dropped to 90% of its initial value. A LiPo battery drained even once to 0% will immediately lose 50% of its initial capacity. We drained several manganese-lithium (ML) batteries to 0% and were unable to observe any loss of capacity afterwards. Figure: Example Discharge Curves for Manganese-Lithium Batteries. We charge the batteries through a 400-Ω resistor using various voltages 2.9-3.3 V. The ML621 is 6.8 mm dia, 2.1 mm thick, 5.0 mA-hr. The ML920 is 9.5 mm dia, 2.0 mm thick, 11 mA-hr. Charging a magnesium-lithium battery is simple: connect it to a fixed voltage through a series resistor. We charged ours with voltages 2.9-3.3 V with a series resistor of 400 Ω. We recorded battery voltage as the battery discharged through a transmitter. The batteries take 24 hours to charge to 90% capacity and 48 hours to charge to 100%. Charging to 2.9 V gives 90% the capacity of charging to 3.3 V. We see no significant degredation of capacity over ten discharge cycles. Because of accumulated damage to their leads and encapsulation, we do not expect a transmitter to survive more than a ten implantations. Figure: Example Discharge Curves for Lithium-Polymer Batteries. Each chart is C/I where C is nominal battery capacity in mA-hr and I is current drain through a transmitter in μA. The fraction thus expressed is the expected operating life in thousands of hours. We charge with a 4.2-V source current-limited to 20 mA for 19-mAhr and 150 mA for 190 mA-hr batteries. We discharge LiPo batteries through transmitters over several months. The plots above show how the battery voltage, as reported by the average value of the X input, declines with time. We have one 190-mHr battery with a connector, one new 190-mAhr battery with a connector, and one 190-mAhr battery encapsulated with a transmitter circuit. The encapsulated battery had been poached at 60°C for several months. The 190-mAhr battery with connector delivered 150 mAhr when discharged at 150 μA and 156 mAhr when discharged at 520 μA. The encapsulated 190-mAhr battery delivered 190 mAhr when discahrged at 90 μA. The 19-mAhr battery delivered between 19-21 mAhr when drained at 40-280 μA. We conclude that poaching an encapsulated battery does not reduce its capacity below nominal. We note that some batteries can deliver only 80% of their nominal capacity, while others can deliver 110%. [29-JUN-18] When an A3028 is equipped with a rechargeable battery, we recharge the battery after explantation. We deliver the charging current through the X and C leads. Re-implanting requires that we either clean cement off the ends of our leads, or cut back the leads to release them from the cement of the head fixture. In either case we are going to have to expose fresh wire for the next implant. We use this fresh wire to make contact with the charging circuit. You can follow our recharging instructions and attempt to recharge the batteries yourself, or you can send your exhausted transmitters back to us and we will recharge them for you. At the same time, we will test the leads for damage to the silicone insulation. We can repair or replaced damaged leads. Our recharging and repair services are included in our price list. [07-DEC-18] We run down the batteries of three A3028T1-R rechargeable transmitters four times. These devices are equipped with the ML621 Manganese-Lithium Batteries, with nominal capacity 5 mA-hr. The current consumption of the A3028T1 128 SPS transmitter is 33±2 μA, so we expect the lifetime of the battery to be at least 140 hours. Figure: Four A3028T-R Chage-Discharge Cycles. Charging with a constant voltage in series with 1-kΩ resistor connected to EEG leads. First and third charges with 4.2 V. Second with 4.1 V. Fourth with 4.3 V.
The first discharge of each battery provides the longest life. Charging with 4.3 V gives greater capacity than charging with 4.1 V. But all discharges give us more than our expected 140-hr life. [30-JAN-18] We encapsulate the A3028 in black epoxy and silicone. The outer layer of silicone is MED-6607, an unrestricted medical-grade silicone. The sensor leads are stainless steel springs coated with dyed silicone. The antenna is either a stranded stainless-steel wire coated with silicone, or a short sensor lead in the case of the smallest transmitter versions. We remove one in ten transmitters from our production line for accelerated aging. These transmitters run until they exhaust their batteries while fully immersed in water at 60°C or 80°C. Corrosion causes the failures of electronic circuits in warm, humid environments. Both silicone and epoxy are permeable to water vapor. An implanted transmitter encapsulation becomes saturated with water vapor. Occasional drops in temperature cause condensation in any cavities that may exist within the transmitter, such as within a cracked ceramic capacitor or beneath a surface-mount component. Condensed water, the warmth of the animal body, flux residue, and electrical voltages combine to promote corrosion that leads initially to loss of performance in the EEG amplifier and ultimately to premature draining of the battery. At 60°C, corrosion occurs over ten times faster than at 37°C in an animal body. We guarantee our transmitters against failure from corrosion while implanted. Our encapsulation procedure seeks to remove flux residue by repeated washing and scrubbing in hot water, and to eliminate cavities in the epoxy by use of vacuum and atmospheric pressure. The minimum operating life of an encapsulated A3028RV3 circuit in 100% humidity at 60°C is 100 days, with the first artifacts of corrosion appearing in the EEG signal after 50 days. Implanted in an animal, we expect no sign of corrosion in the EEG for 500 days, and no failure through corrosion for 1000 days. None of the popular versions of the A3028A run for 500 days. 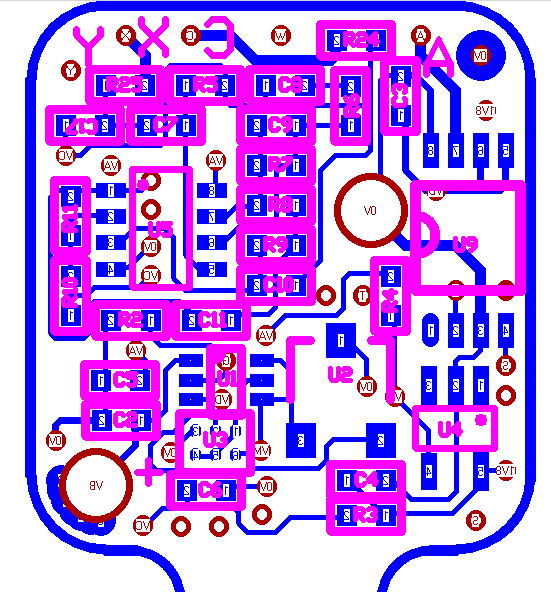 The A3028GV1 circuit we have just introduced for use in mouse transmitters. We poached ten devices at 80°C. Two stopped transmitting after 6 days, which is equivalent to 360 days implanted, and the remaining 8 lasted 13-14 days, which is their full operating life, and equivalent to 780 days implanted. Looking at our notes we find that we did not clean these circuits a second time before encapsulating, so we suspect the two early failures were caused by flux residue and moisture. But in any case, none of our mouse transmitters run for more than 100 days implanted, so we have no fear that these will fail prematurely by corrosion. We have moved our development to a separate page, Subcutaneous Transmitter Development.